It may seem like a strange notion to those who have never done it before, but buying a great pair of binoculars takes quite a bit of research and knowledge. Just like anything else, a quality pair of binoculars will provide you with a lot better images than buying a cheap pair from a discount store. As technology has improved, binoculars have become more modern and have improved in quality. We hope that this guide and the reviews in it will be useful to you in finding the perfect pair of binoculars for your needs. Choosing just one pair of binoculars to crown as my number one pick is a difficult thing to do. But if you made me do it, I would choose the Upland Optics Perception HD 10x42mm. These guys are tough as nails and give an excellent picture quality. They have the perfect magnification and field of view for a general pair of binoculars that could be used for everything from hunting to bird watching. Our partner company Upland Optics does an amazing job, these binoculars are first class! Click here to see their price. When hunting big game, binoculars are one of the most important pieces of gear you will need. They will allow you to scan for animals that are thousands of yards away, that you wouldn’t be able to see with your naked eye. This makes them an indispensable tool in the field. There are a few key things to keep in mind when choosing a pair of binoculars for hunting. First off, remember that you’ll often be looking for animals in low light conditions, so light transmission is crucial. Also, you’ll be lugging them around difficult terrain, so buy a quality pair that will be able to take a few bumps without any major problems. 10×42 is the most common size of binoculars to carry while hunting, although you may want a larger pair if you are doing long range spotting. 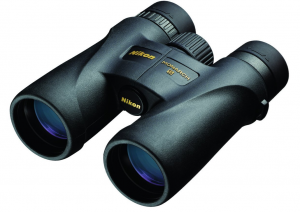 Nikon Monarch binoculars come in three sizes: 8X42, 10X42, and 12X42, so you have many choices at your disposal. The standard 10X42 have a 288 ft. field of view, and 18.4mm eye relief. Also, these binoculars are waterproof, fog proof, and have coated lenses. They weigh around 21.9 ounces. These are Bushnell’s most critically acclaimed binoculars, and it is no surprise that they are some of the best binoculars for hunting out there. They come in 4 sizes: 8X36, 8X42, 10X36, and 10X42. The 10X42 variety have a 340 ft. field of view, and 15.2 mm eye relief. Like the Nikon pair, Bushnell Legend Ultra binoculars are waterproof, fog proof and have coated lenses. They weigh in at 24.7 ounces. The upgraded version of our #1 recommendation above, the Venator are the pair to get if you are a hunter looking for the best glass possible and have a bit more of a budget. With excellent light transmission and lens coatings, they deliver top grade optical performance while also being durable enough to survive hunting in the toughest of environments. Vanguard’s Spirit ED binoculars are very worthy of mention in this section. They come in four sizes: 8X36, 8X42, 10X42, and 10X50. The 10X42 pair have a 314 ft. field of view and 16 mm eye relief. Like its counterparts in this section, these binoculars are waterproof, fog proof, and have coated lenses. They weigh a bit more than the other binoculars in this section at 29.8 ounces. If birding is your hobby, the following are some binoculars that you should definitely consider purchasing in order to have the best viewing experience. Because birding is more about the picture quality and feel, picking a pair of binoculars without trying them first is very difficult. I have included some comments from users in order for you to get an idea of what it is like to use all of these binoculars. If your main priority is high quality glass and you don’t want to spend a fortune, the Cronus might be the perfect fit for you. High quality glass and ESP Dielectric coating give these binoculars excellent clarity and light transmission, making them perfect for bird watchers who want to see every detail. These binoculars are considered top-of-the-line, and this is noticeable in the price tag. They feel great in the hands and have great clarity and eye relief. They are widely considered some of the best binoculars that money can buy. These are a smaller version of the THT binoculars, but they still have all of the benefits of a top-of-the-line pair of binoculars. If you can afford these, you cannot go wrong with them. Zeiss also has midrange priced binoculars, Zeiss Conquest HD, which are of excellent quality and a great alternative to the Victory line. 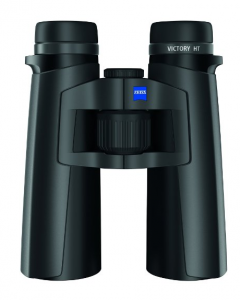 These are ¼ of the price of binoculars like the Zeiss Victory, but they deliver exceptional quality and image. The Monarch line has been very popular among birders for years, and it continues to deliver. The Trinovid line has been around for a long time, and experienced birders will likely recognize it. The new Trinovid line offers exceptional quality and a bright, clear image. If you are looking for compact binoculars that you can take with you comfortably everywhere, here is a list that will give you an idea of where to start looking. The following are widely considered some of the best compact binoculars on the market. These are very high quality compact binoculars that fold up easily and can fit in your pocket. Furthermore, they are waterproof and fog proof. They are made by Swarovski, so you know you are getting some of the best binoculars on the market with these. These binoculars feel great in your hands, as they have a very lightweight rubberized body. The shape is very compact, and they can fold down to store anywhere. Furthermore, these binoculars are very affordable. These compact binoculars have a very unique design, and they have a great minimum focusing distance. This means that you can view insects and flowers with great detail out in the field. They are great hiking and general purpose binoculars. Furthermore, they are also very affordable. These binoculars are unique in that they have a zoom button that lets you go from 8X to 24X at the push of a button. This may not be very attractive to some binocular buyers, but another draw to these are that they are affordable and still provide great image quality. Unlike many compact counterparts, these binoculars offer a 9X magnification without sacrificing too much field of view. They are waterproof and fog proof, and while they are mid-priced binoculars, they offer exceptional optical quality. They also have a great design and feel great in your hands. Many stargazers and astronomers prefer to use binoculars instead of telescopes to look at the stars. If you want to get into stargazing, or are already an avid stargazer and are looking for binoculars, the following are a few binoculars that are definitely worth your consideration. Since you are stargazing, you want a higher magnification along with a bigger lens. These are very high quality binoculars that are tripod adaptable in order to allow for long stargazing periods. They are not too heavy that you cannot pick them up and use them with your hands for added flexibility. These offer exceptional performance and come at a great price for viewing the night sky. The lenses are multicoated, which makes your image of the stars much clearer. Aside from stargazing, these have other great uses including bird watching as well. 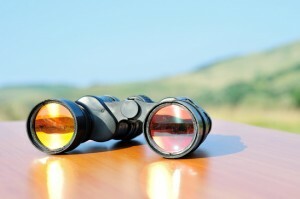 These binoculars were specifically designed for stargazing, so it is no surprise that they are at the top of the list. They have sturdy metal construction and the magnification is optimal for looking at the stars. These binoculars are waterproof and fog proof, so you can take them with you anywhere and enjoy the night sky. If you enjoy viewing wildlife, specifically wildlife on safaris, there are a few binoculars that you should research and test before looking at any others. Consider these as you embark on your safari trip. These binoculars have a wide field of view, which is excellent for safaris. Since they are 9X, you get a little more detail of the object you are looking at. The lenses are very high quality, and with these you will get a very crisp image. These are top-of-the-line midsized binoculars that offer impeccable optical quality. They are optimal for taking on safaris, and their open bridge design makes them comfortable to hold with one hand. Furthermore, they offer a digital camera adapter so that you can take high quality photos through them. Swarovski produces some of the best imaging products in the world, and this is no exception. With a colorful casing guaranteed to catch your child’s eye, the Bresser 6×21 is a compact binocular with a maximum 6x magnification that is perfect first binocular for children of any age. The state-of-the-art optical system delivers clear images, while the rubber armored body is built to endure all types of damage. Affordably priced, the Bresser 6×21 also comes with a five year guarantee. Built for the older child, the Opticron Discovery is both compact and lightweight enough to deliver comfort regardless of how long the nature walk lasts. An 8x optical system also delivers clear images from a distance, while the affordable prices guarantees a great return on the investment. With a durable design built to last through years of wear and tear, the Opticron Discovery remains one of the best children’s binoculars on the market. Though the slightly heavy design may seem inconvenient at first, the Vivitar Digicam Binoculars are well worth the effort with a 640X480 resolution on the attached camera. Add to that the 16 megabytes of internal storage and these camera binoculars become perfect for both long and short sightseeing events, from sports games to nature walks and more. Designed for comfort and precision, the Vivitar 10×25 carries a long battery life as well to ensure long-term use on almost any outing. With the widest selection of digital camera binoculars, Bushnell boasts an impressive catalogue. However, one of the standouts remains the 8×30 Instant Replay Camera Binoculars. As if taking crystal clear pictures of the best sights wasn’t enough, this Bushnell binocular also allows users to record video with up to 3.1 megapixel resolution, higher than other comparably priced binoculars in the industry. Though pricier than other brands of binoculars, the reward is well worth the cost as the Leica Geovid is one of the most accurate rangefinder binoculars on the market. Featuring state-of-the-art optics and a field of view exceeding 1,000 yards, these industry-leading Leica binoculars offer everything from automatic adjustments of the visual settings to an ergonomic design that ensures comfort regardless of how long they are held. Fluoride glass is one of the secrets to the Zeiss Victory’s premium imagery, ensuring that every sight seen through these lens is of the best quality possible. A 45 millimeter objective lens adds to sight quality while the field of view remains one of the best in its class. Though slightly heavier than other comparable binoculars, the Zeiss Victory makes up for it with convenient button placement for added comfort. After all of the binoculars that have been listed so far, you may be wondering, “Which ones provide me with the best value?” The following binoculars are widely thought to give buyers the best bang for the buck. Although they may seem pricey, these binoculars are cheap compared to the other $1200+ priced binoculars that Swarovski offers. Furthermore, they are better than almost anything else on the market. These binoculars have amazing specs, they are waterproof and fog proof, and they have a lightweight body made of magnesium. Add to this the unparalleled optical quality that they offer and you will realize that the price is a great bargain. These are some of the best binoculars out there at any price point, and they are under $300 dollars! They offer exceptional optics, water repellant lens coating, a light weight chassis, and unparalleled image quality. These will appeal to those on a tight budget, but also to those looking for a great value and optical quality. These are fully sealed waterproof and fog proof binoculars that deliver a great image, and the price will make you very happy. If you are on a very tight budget and can only spend $100 or less, you should not worry. The following binoculars will offer great quality for their price. These binoculars are so good that you may find some vendors selling them for $200 due to demand, but if you look in the right place, mainly online, you can find them for $100 dollars. They provide a quick central focus system and a 420 foot field of view. One downside to these is that they are not waterproof. By this time you should realize that Celestron makes great quality products at a great price. These are great for stargazing and many other uses, and they have a water-resistant, not waterproof body. If you have a little more to spend, these are some binoculars you should consider that are under $200 dollars. These binoculars offer a wide field of view, multi coated lenses, and high quality images. If you are a causal binocular user, you simply cannot go wrong with these. If you want high quality, low weight binoculars, then you have found them. These are fully waterproof and fog proof, and they provide a relatively good field of view and close focus. These are a great choice for the budget conscious buyer. If you want the best-of-the-best, and you are fortunate enough to have no price limitations on the binoculars that you are looking for, then the following is a list of the best binoculars that money can buy. See description in the Best Value section. These are often listed as the best binoculars that money can buy, period. They offer a viewing experience like no other binoculars, and you can see even the finest details of your object in dimming light. They are very robust, and offer a staggering 95% light transmission. If you want the best-of-the-best, then these are the binoculars for you. Bushnell is a giant in imaging products in the United States, and it makes everything from high quality rifle scopes, microscopes, telescopes, and of course, binoculars. The company was founded in Japan by David P. Bushnell when it was occupied by Allied forces during WWII in 1948. Bushnell’s binoculars have won multiple awards for their quality, and most recently, the Bushnell Legend Ultra HD 10X42 binoculars were awarded binocular of the year by binoculars.com. Zeiss is one of the oldest, most reputable optics and imaging companies in the world, and it makes very high quality binoculars. Not only does it deal in sporting optics like Bushnell, but it also makes optic devices for medical use and even space telescopes. It was founded in Germany in 1846, and it has become a leader in the industry since then. One of the most popular binoculars it has on the market right now are the Zeiss 10X42 Victory HT binoculars. Known for its digital cameras, Nikon also makes stellar binoculars. Nikon is now a huge company that was founded in Japan in 1917. It specializes in lenses, binoculars and other advanced imaging technology. Their best-selling binoculars have historically been from the Monarch line. Today, the 8X42 Monarch 5 take that distinction. Zhumell is not a large company like the three that were previously mentioned, but it prides itself on bringing high quality optics to people for a reasonable price. It produces binoculars, telescopes, spotting scopes, and monoculars. Their 10X42 short barrel binoculars are very high quality and in high demand. Steiner has a rich history in the optics industry, and it has arguably one of the most advanced optics laboratories in the world. Every lens and pair of binoculars that Steiner produces is field tested extensively to ensure that it is a very high quality product. This German company prides itself in producing binoculars that will be serviceable for multiple lifetimes. You can be sure that if you buy Steiner binoculars like the Safari Ultrasharp 8X22, you will have a product that you are satisfied with for life. Of course, this is not an all-inclusive list, and there are many more manufacturers that make outstanding binoculars. If you are in the market for a pair of high quality pair of binoculars, you should not limit yourself to these brands. The world of binoculars is huge, and it will take many years for the beginner to explore and learn. With time, you will be able to appreciate minor differences between binoculars, and you will develop a taste of your own. I hope that this guide will provide you with sufficient information to begin your exciting journey into the world of binoculars.